Everything you need for caring and keeping healthy a Large Conure. From food, treats, toys & cages, to accessories, toy making parts &supplement. Unbelievably large selection of everything you need for your Large Conure. High quality cages, food, treats, perches, stands, toys & toy making parts, feeding dishes, hideaways, supplement and many more accessories. All designed and built with Large Conure in mind. Are you a Conure owner? More specifically, a Large Conure owner? 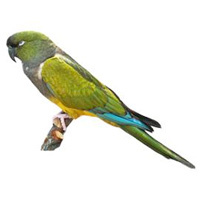 If you are, you more than likely have either a Blue-crowned Conure, Patagonian Conure or Nanday Conure. Whatever species you have, you know that having a Conure as a pet is always fun since your bird is known to be very intelligent, show offs, and have quite the personalities! When it comes to keeping up with your Large Conure, toys and treats are a huge part of your bird’s daily life. Being so intelligent, your Conure needs lots of mental stimulation, activities, and rewards for good behaviour. You can find all that you need from our large selection of toys. We carry toys for foraging, swinging, climbing and great training toys. Spending time, teaching, and bonding with your bird can be easy when provided the right materials. As for treats, we offer nutritious and delicious varieties, something your pet will surely enjoy. Your Large Conure will relish every bite of our treats, and you’ll have no worries because they are all free from artificial ingredients and made from natural ingredients. Of course, a balance to diet is crucial. To ensure your Large Conure is getting the proper diet and nutrition, we carry a wide range of foods like; complete foods, pelleted foods, fruit and seed mixes, and more. You also can choose from different flavours of mixes that your bird will surely love. In addition, we offer many supplements for your Large Conure. Achieving a vitamin and mineral full diet is easy with our range. We carry scientifically proven and veterinary formulated products that will give your pet the right boost for good health and an active lifestyle. When considering a cage for your Large Conure, remember the toys, perches, and accessories that may take the space your bird’s cage. Browse our variety of cages to suit your bird perfectly. We have different styles and sizes, as well as features like open top cages and play tops. When your Parrot is spending time out of his cage, a stand is always a good idea. This ensures that your bird will have somewhere fun and safe to perch. As for accessories, we have a wide range of things your Large Conure may need. Whether it’s cleaning supplies for your bird’s cage, instructional CDs and DVDs for your training and care knowledge, feed bowls, or perches. Choose what best fits your requirements for your pet!